Regardless of the truck and camper combination that we own, many of us who do, will modify and upgrade our suspensions ... eventually. Our rigs are often unique. Choices of both truck and camper manufacturers; the weights, specifications, configurations and layouts of those selections and finally the gear and equipment each of us travel with; will contribute to how different our rigs are from all others and consequently, effect 'how' we build safety and improved drive-ability into our suspensions. porpoising - Is a term used to define the 'fore and aft rocking' of a vehicle during travel. Top-heavy, short vehicles (like truck campers) are more prone to this than others. The regular spacing of the joints in concrete highways frequently causes porpoising. sagging - Is the tendency of the rear end of a vehicle to press down or squat on its springs, when loaded heavily. jounce - This is the inward reaction of the spring and shock absorber when a wheel hits an obstruction. The upward movement or compression of suspension components. rebound - This occurs when the suspension system expands. It happens after jounce. bounce - Repeated occurrences of jounce and rebound. tires - Provide a flexible cushion that 'dampens shock' as a vehicle rolls over rough features. 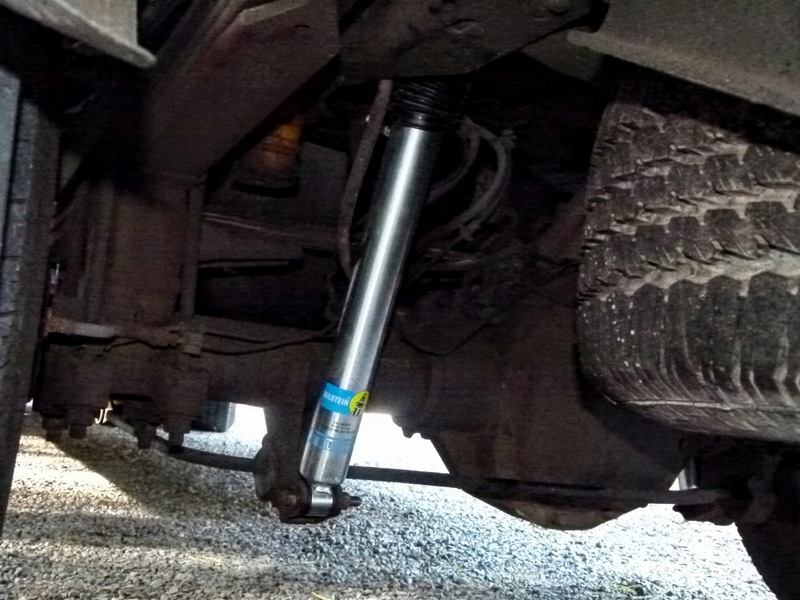 shock absorber (shocks) - A primary suspension component that helps 'dampen shock' by preventing continued bounce every time a vehicle accelerates, stops, corners or hits a bump. Shock absorbers are designed to slow and reduce these movements to help control the weight of the vehicle during transitions and also to allow a vehicles tires to perform better. supersprings - These are self-adjusting suspension stabilisers engineered for vehicles with a leaf spring rear suspension. The right hand side of the spring bracket is fixed but the left (rear) is set on upper and lower rollers that allow the spring to automatically adjust to different hauling loads and to varying weights from side to side. Centre of mass can be different and the suspension stays level regardless. They are intended to 'correct sagging' and to 'resist sway'. leaf springs - In a suspension, these hold up the weight of the vehicle and help 'resist pitch' to the front and rear, and (in conjunction with the vehicle's sway bars) 'resist lean' to the sides. anti-sway bar (roll bar, anti-roll bar, sway bar, stabiliser bar) - This is a component of vehicle suspensions that helps 'reduce body roll' during fast cornering or over road irregularities. A sway bar increases the suspension's roll stiffness; which is its resistance to roll in turns, independent of its spring rate in the vertical direction. stabiliser bar and tie downs - These components use leverage to safely reduce the forces on the truck and control the campers' movement in all directions. The configuration provides total 'control of front-back, up-down, and side-to-side movements'; and also 'controls the yaw, pitch and roll' of the camper. cabover struts (camper stabilisers) - These 'dampen for to aft motion'; the tendency of the heavy cab-over area of a camper to undulate or porpoise (front to rear) on rolling or wavelike roads. 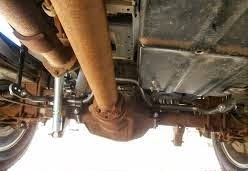 Our trucks' original suspension consisted of a front stabiliser bar, higher rated front coil springs, a 2-leaf rear spring pack with lower and upper helper springs, a rear sway bar, RANCHO 9000 shock absorbers and TOYO A/T II 275/75R18 tires. 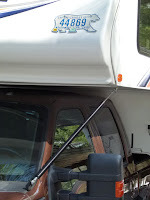 The camper was installed on the truck using the HAPPIJAC tie-down and stabiliser bar system. We made changes to our rigs' suspension, one component at a time, with reasonable periods of usage in-between. This enabled us to review the effectiveness of changes under real-life driving conditions. With the exception of one component, the majority of suspension upgrades made a significant change to the drive-ability of our truck camper. In all cases our rig was loaded approximately the same. 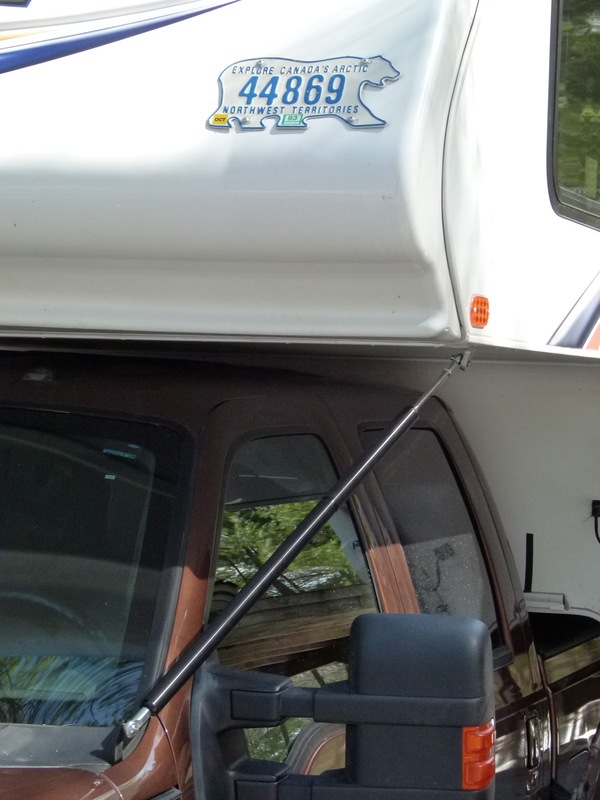 Our truck is dedicated to hauling a camper; the camper is only removed if it's necessary for servicing, or periodically, while camped for an extended period. We did not choose an air bag system because we don't have a requirement to re-level the rear of the truck, due to changing loads. A custom rear leaf spring build was much less expensive for us and is not as prone to breakdown. A certain percentage of our travel is on rough, gravel roads in remote areas. We travel in all seasons when driving conditions can become slippery from mud, ice or snow. We chose a 4x4 SB SRW truck because of it's improved departure angle and better tracking capability under slippery conditions. Which wheel and axle configuration, do you think will track the best? Alternative components, such as torklift stable loads, sumo springs, timbrens, load range F tires or super-single tires and rims, etc., are also available to correct these same problems; and they were all considered. A couple of these upgrades were too costly and just not feasible as a retrofit. In general, none were suitable for our particular truck and camper combination or for our planned usage. The following driving log, documents the suspension components we chose, to correct drive-ability issues at a given odometer reading (kms). We purchased the truck used with approximately 51000 kms on the odometer. During our first major road trip, we experienced several episodes of fairly severe porpoising. Upgrade Installed LANCE Cabover Struts. Result Condition much less severe, now controlled. With the rig fully loaded, we had approximately 2.5 - 3" (drivers' side to passenger side) of sag in the rear suspension. Modification SUPERSPRINGS Model ss13 (@ lowest setting) were added to the original rear 2-leaf spring pack (w. upper and lower helpers). Result Still about 1.5" of sag when fully loaded. Seems to be less sway. The OEM shocks were past their serviceable life and were no longer controlling bounce. Upgrade From RANCHO 9000 to BILSTEIN Series 5100 hd rv shocks. Result Suspension flex and rebound are now more effectively controlled. The BILSTEINs' come with a lifetime warranty. Our rig is approximately 13' tall with boats on the roof and therefore prone to sway. Improved shocks have aided in resisting side to side sway when cornering or in side wind conditions; but have not fully eliminated it. Upgrade Removed OEM anti-sway bar and upgraded to a HELLWIG Big-Wig anti-sway bar, set at stiffest setting. Result There is still some sway but now less severe. Still about 1.5" of sag when fully loaded. Diagnosis The upper helper is scoring and restricting the movement of the SUPERSPRINGS. Verified that model ss13 is correct for this truck and have concluded, the original installation was not done correctly. Modification Removed upper helper spring and adjusted SUPERSPRINGS to medium setting. Result Some improvement but the vehicle is still not level. The campers' slide-out adds a minimum 300 - 400 lbs to the passenger side. Result The locator bolt cannot be moved enough to line up with the highest position. Unsuccessful. Diagnosis The truck sits 1" - 1.5" low in the rear; lowest on the right side, due to the additional weight of the camper slide out. Upon inspection, the left rear SUPERSPRING had caught and damaged the emergency brake cable and was rubbing on the skid plate for the fuel tank. Due to the location of the rebound clips on the original spring pack, the SUPERSPRINGS had become incapable of self adjusting as designed and it was also physically impossible to increase the tension on them to their highest setting due to the dimensions of the springs. Tires less effective in some driving conditions, nearly worn out after 48000 kms. Result Less tire flex with stiffer sidewall. A +486 lb/tire load capability. Diagnosis After 55715 kms, the SUPERSPRINGS have become incapable of self-adjusting as designed. Modification Rebuilt Rear Suspension ... as a 4-leaf spring pack with upper and lower helpers. The load capability / side for this suspension upgrade is 7000 lbs; well within our payload range requirement of 3500 - 4000 lbs. Sag has been eliminated. The rig now sits roughly 3/4" higher in the rear than the front and is within 1/4" side to side. The upper helper is 1/4" below the frames' bump stop; once under load, the rear suspension engages sooner and activates quicker. Any Sway that occurs is promptly controlled; the amplitude has decreased, penduluming does not repeat as often and the vehicle returns to center quickly.
' These alterations will not increase our trucks GVWR. In the end, only two suspension modifications were made; the installation of cab-over struts and 2 leafs added to the rear spring pack. All others changes entailed upgraded components; higher payload tires, heavier duty shock absorbers and a stiffer rear anti-sway bar. These modifications and upgrades have been made over 76715 kms and 4 seasons. The only additional improvement left to make would be the installation of an upgraded front anti-sway bar. The weakest component in this suspension, are the rear wheels which are rated at 7050# total / axle, but may carry loads ranging between 7613# - 8113# total / axle. We have a 4 month / 20000 km road trip and combined overland drive planned for this coming summer and autumn ... that will provide a thorough test period for this most recent upgrade. Thanks to LOAF's mechanic, Shane Hanthorn at Cannifton Garage for providing technical editing. 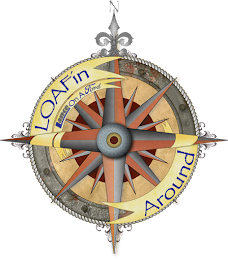 If you're interested in following along, as we put LOAF's suspension to work, click on LOAFin Around.